Iam trying to improve our service quality by adding this Guest Book features. 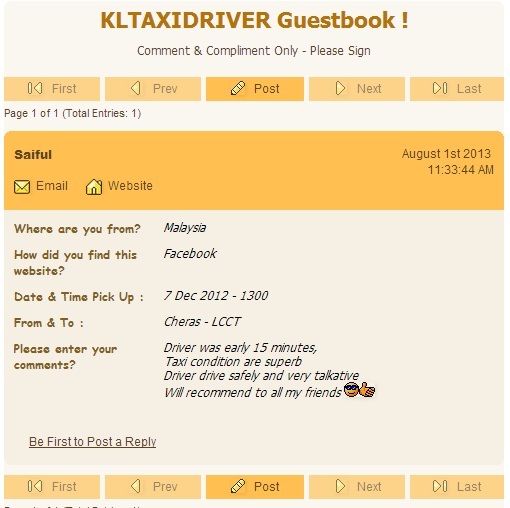 I hope customer could use this features to help me recognize our weakness & strength so that KLTAXIDRIVER could become 1 of the best taxi booking service in Kuala Lumpur. This guest book is not for asking a quote price / question, its just for existing customer that already used our service to write a complaint or compliment. I hope for those that signing My Guest Book can provide all the information i stated so that i could recognize u. Dont worry, i could easily find out because i keep all my customer email, contact no, messaging & etc. Any signature are not related will be delete immediately. Please use proper language to write.